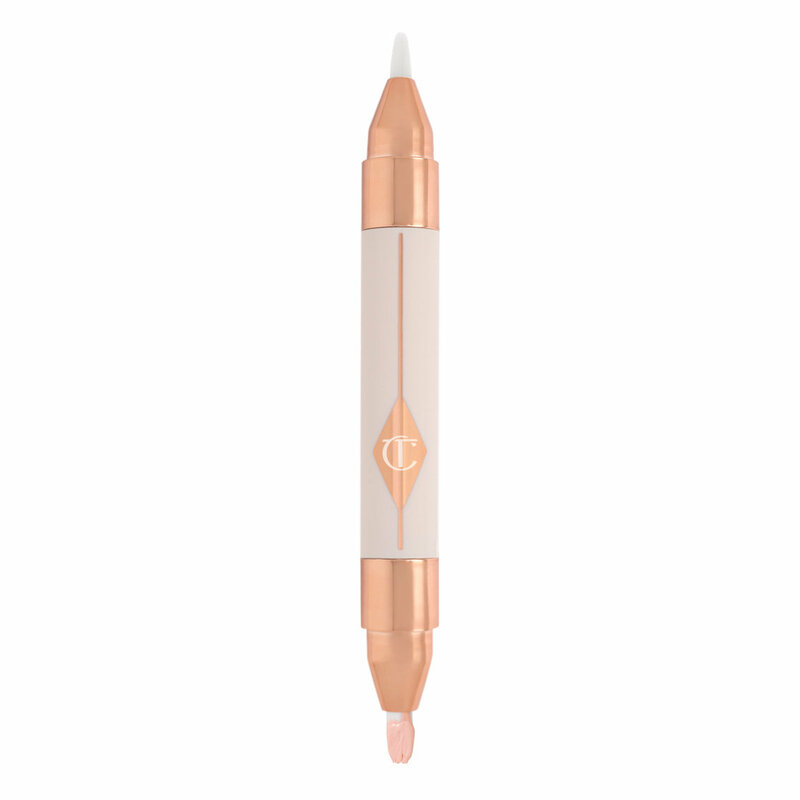 Five years in the making, Charlotte Tilbury’s genius Mini Miracle Eye Wand is the antidote to tired, dull and exhausted under-eyes. It is the perfect 5 actions in 1 Miracle Wand for everyone! When you are tired, the color drains from your face making you appear more sallow, grey with dark circles around your eyes. The Mini Miracle Eye Wand creates the appearance of 8 hours of sleep in just two clicks by expertly covering dark circles and lines, smoothing out bags or hollows, brightening the eye contour, and hydrating the skin’s surface for a dewy, luminous finish. Touch-Expert Concealer #1 a month ago. Tried Charlotte Retoucher by itself, didn't satisfy me, until this duo wand came out. The eye cream is hydrating enough, good for the day. It didn't irritate my sensitive skin. Shade 1 is a light pink color, less pinky tone than By Terry(salmon pink). I use this to correct my dark circles, then The Retoucher #2. After it dries, I use Miracle wand again, don't need to twist it, just gently pat the brush on the eye bag area. It hides almost 100% of my under eye problems. I'm thrilled to find the best combo for my dark circles and eye bags! For any Asian girls who's confused about the shade, I have quite light Asian skin tone, if you have natural skin tone, get Shade 2(it has a bit pinky tone as well). Shade 2 worked on my friend really well. Although the concealer is really nice quality and does conceal the majority of the blue discoloration under my eyes, for the price I expect a bit more. The delivery mechanism for the eye cream and the concealer is really poorly designed. You have to click for ages because nothing comes out, and then when it does its a huge blob that is more than you need so you end up wasting product. It reminds me of the Ellis Faas click pens which are horrible! Also the amount of product you get is really small compared to her regular retoucher concealer (which is a better product and cheaper in my opinion!). The Retoucher is $35 for 3.5ml and the Miracle Eye Wand is $45 for 3ml (if divided equally then thats only 1.5ml of concealer for $10 more...). Really not good value for money and I love my cheap Maybelline Age Rewind Concealer so much more!! If you want a CT Concealer, go for the Retoucher, its much nicer and cheaper and you get more product. Disappointed with this one to say the least. First of all, let me begin by saying: wow. This really IS 8 hrs of sleep in a tube. I have genetic dark circles that get worse w/ reduced sleep and/ or stress, but with this you'd never know it. I like to use mine in conjunction with my eve pearl corrector concealer. I lay down some of the eye cream from one side of the wand; then I follow with a little eve pearl only in the darkest spots. After that I follow up with this concealer (I use #2 and I'm neutral light) applied with my finger. This concealer melts right into the skin, it does not look creepy or heavy, and it blends beautifully. It's a thinner formula but pigmentation is very impressive. I wore this for the first time on a long day of travel through airports (i.e., dry, gross air( and when I reached my destination it still hadn't budged and looked great. No touch ups necessary. Charlotte is truly a formula genius, I highly, highly recommend this. I normally use Bobbi Brown Corrector and Concealer Duo and thought those products were all I needed. Hmmm....CT is competing neck n neck to my beloved Bobbi. It definitely does an awesome job at concealing and brightening up the Undereye area without looking like a mess. My one complaint...the eye cream smells horrible. It dissipates after a few minutes but not soon enough. Also it's vital that one does not over apply the concealer because by the end of the day it will emphasize fine lines you didn't know you even had. Is it worthy of replacing Bobbi? No. It's a nice addition to the family on those days when you need something quick and aren't looking to do a full face look. Let's be real. Staring at a computer all day is not the business for your eyeballs. It definitely can cause eye strain and worst of all, leaving my peepers feeling super tired by 4pm. Enter Charlotte's new Miracle Eye Wands. The eye cream side helps to hydrate and lift the eye area (and leaving it feeling refreshed) but I also detect a bit of a cooling sensation, which is nice too! The other side highlights and illuminates the eye area, thus giving it more of a brightening effect. Definitely let the eye cream side dry before going in with the highlighting side to get the most smooth finish. I will say, this is not really meant to be a concealer, so if covering is your main concern, look at the Retouchers for that. It definitely made me look more wide awake and any slight darkness was erased. I love a pen applicator bc it makes throwing into my purse super easy and it's pretty easy to dispense the product too. I'm about a shade 6/7 in her Light Wonder foundation and shade 2 works perfect for me, 3 was a bit too peachy for the intended use. 4pm afternoon tired eyes, BE GONE!! Be patient with the amount of time it takes for the product to dispense otherwise you'll have a GLOB!! It covers without making the under eye area look crepey and ancient, even if you're layering it under and over the Retoucher. 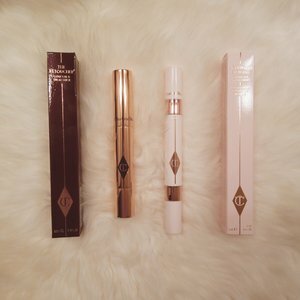 I am a huge fan of Charlotte Tilbury products. And this is the first of the line I have not really liked. I feel like it's quite tiresome to get any product out (I have to at least twist 3 times for anything to come up). Both sides only spits up a tiny amount, that I have to re-twist yet again to get something to come up. May be I received a faulty wand, but I don't think I will be reordering this product in the future. I would've given 5 stars if the packaging wasn't so troublesome. We all know that with these style click pens it takes forever to actually release any product but once you do you're golden. Well for me every time I go to use it I have to click it at least 5-10 times for any product to come out and then when it does it spits out a big glob. It must be that mine has a lot of air pockets. Besides that I find that the product itself is great and really does a wonderful job of brightening the eye area. It is not full coverage but does cover a lot while still looking natural. I would definitely recommend. And I'm hoping that my packaging flaws are not considered standard with this product.